The Susquehanna River, at 464 miles, is one of the longest rivers on the east coast. It flows through three states, New York, Pennsylvania, and Maryland. The fact that it provides almost 50% of the freshwater to the Chesapeake Bay has made its future health an important focus of the federal government and national policy makers. A part of the river that is receiving much of this attention is the stretch that borders Lancaster and York Counties in Pennsylvania. It is a dramatic landscape with high points, gorges, and broad river reaches. The presence of four large power dams provides large expanses of flat water, a picture of industrial might, and below the dams white water experiences and a chance to look at the river’s geologic bones. With a little coaching, the human history of landscape can also be read. Three river towns, Columbia, Marietta and Wrightsville, were once centers of commerce. Even now they are connected by remnants of downstream canals and both abandoned and active rail lines. The proximity to the Mason-Dixon line made the region an important stop on another transportation system, the Underground Railroad. Fragments of bridge piers tie the region to a dramatic moment in the Civil War – the burning of the Columbia-Wrightsville covered bridge by the local militia, undertaken to stop the Confederate troops in their march on the state capital of Harrisburg. And, perhaps most significant of all, this region has a nationally important story to tell of life before European contact. It was once the site of the most densely populated American Indian settlements on the eastern seaboard. Over 3,000 people are estimated to have lived in just one the region’s large palisaded towns known as the Washington Boro site, many times the population of the place today. The rich riverine environment supported intensive farming, hunting and fishing. Today this is a place that local people value, but needs some definition for those outside of the region. 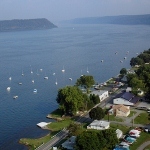 As a consultant, charged with making recommendations for the Pennsylvania Department of Conservation and Natural Resources, noted “the residents view the river as their backyard not their front yard.” However, this is all changing and the Lower Susquehanna is stepping into the limelight. The region has been designated by the state as the Susquehanna Gateway Heritage Area and as the Susquehanna Riverlands Conservation Landscape. More recently there has been a flurry of national recognitions. On May 16, 2012, Secretary of the Interior Salazar recognized a large part of the Susquehanna River in Pennsylvania as a component of the Captain John Smith Chesapeake National Historic Trail. The Department of Interior designated the Lower Susquehanna as one of the two Americas Great Outdoors initiatives in the State. And Congress has stepped up and introduced a bill to elevate the Susquehanna Gateway Heritage Area to National Heritage Area status. All this attention is coming just in time. One of the reasons the Lower Susquehanna has remained so scenic is the over 13,000 acres of undeveloped utility land along its shores. With the changing economics of the energy business all these open lands are in a state of flux. This web site reported on the piecemeal sale of some key archeological sites in a recent post – The Lower Susquehanna: A Landscape of Loss. While there is recent good news with the purchase and protection of over 1200 acres of PPL Utility land by the Lancaster County Conservancy, there is more work to be done and more money to be raised. The good news is that the region is making a name for itself!